Did you know you can now order your Deliveroo takeaway from Ichi Riki Sushi House here on View? 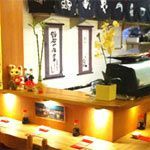 With a cosy setting and quality Japanese fare at excellent prices, Ichi Riki Sushi House is a popular establishment which prides itself on its friendly environment. Do you work at Ichi Riki Sushi House? What did you think of Ichi Riki Sushi House? Ichi Riki Sushi House is simply the best sushi I've had in London! It's beautifully fresh, the spicy tuna inside out roll is fantastic as is the ebi and in fact all the dishes they serve. Ichi Riki Sushi House has great chefs and the waiting staff are good. The prices are fair and are less expensive than other big chain sushi bars. The location is slightly off the beaten track but those who work in the area will know it's a gem and a well kept secret. The restaurant is small, in a basement and there's little room for manouevre but you don't go for the decor or views. Ichi Riki Sushi House is very small and does get packed quickly at lunch and early dinner time so go early and beat the rush. Sushi is the new salad – trust me, I know. Forget nibbling on a lettuce leaf every lunch time, get down to Ichi Riki and chow down on some low fat sushi. You’ll lose weight and look cool at the same time. Thanks Ichi Riki for making dieting more fun! I read about the Ichi-Riki and a friend of mine told me it was quite good when he went. I would say that things have changed and taken a turn for the worse. A friend and I were on a Thursday night the only people in the small restaurant. Apart from the ambiance, the food was quite average. Few quick commets and then you make your decision: 1. They informed us the salmon was not fresh that evening, so we shouldn't order it. They said they would replace all the salmon platters with tuna, but then gave us salmon anyway. 2. The spicy tuna rolls were tuna rolls with tabasco sauce. Disgusting. I have never seen this...ever! 3. I didn't get sick, but after seeing the state of some of the food coming out I'm a bit surprised. Overall, I predict this restaurant will be closed in six months from the time of this review (27 August 2008). The clock's ticking!